A motorcycle gunman opened fire Monday in front of a Jewish school in the French city of Toulouse, killing a rabbi, his two small sons and one other child, the prosecutor's office said. TOULOUSE, France (AP) — A gunman on a motorbike opened fire Monday at a Jewish school, killing a rabbi and his two young sons as they waited for a bus, then chased down a 7-year-old girl, shooting her dead at point-blank range. It was the latest in a series of attacks on minorities that have raised fears of a racist killer on the loose. Authorities said the same weapon, a powerful .45-caliber handgun, was used in two other recent shootings in southwestern France, also involving an assailant who fled by motorbike. Those attacks left three people dead — military paratroopers of North African and Caribbean origin. The shootings echoed across a nation that has been focused on an upcoming presidential race in which issues about religious minorities and race have gained prominence. President Nicolas Sarkozy — facing a hard re-election battle — raised the terrorism alert level in the region to its highest level, while also noting a possible racist motive. "This act is despicable, it cannot go unpunished," Sarkozy said in a prime-time address to the nation. "Each time this man acts, he acts to kill, giving his victims no chance." Monday's attack was as quick and methodical as it was terrifying. At around 8 a.m., with more than 100 students and other worshippers inside a synagogue adjoining the Ozar Hatorah school, the gunman coolly got off his motor scooter. He opened fire at 30-year-old Jonathan Sandler, a rabbi who taught at the school, and his sons, 4-year-old Gabriel and 5-year-old Arieh, while they waited for a bus to a Jewish primary school across town. As the shots rang out, panicked students darted inside the school grounds and the attacker chased them, witnesses said. At one point, he grabbed the principal's 7-year-old daughter, Miriam Monsonego, by her hair, shot her in the head and fled. Cries of, "There are shots! there are shots!" rang out in the synagogue, recalled a 29-year-old neighbor who gave only his first name, Baroukh. He said some children took refuge in a basement. Nicole Yardeni, a local Jewish official who saw security video of the attack, described the shooter as "determined, athletic and well-toned." She said he wore a helmet with the visor down. "You see a man park his motorcycle, start to shoot, enter the school grounds and chase children to catch one and shoot a bullet into her head," Yardeni said. "It's unbearable to watch and you can't watch anymore after that. He was looking to kill." 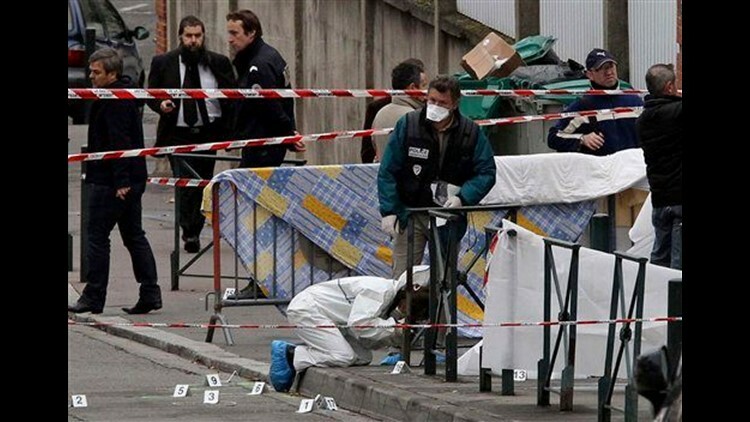 Toulouse Prosecutor Michel Valet said a 17-year-old boy was also seriously wounded. "He shot at everything he had in front of him, children and adults," Valet said. "The children were chased inside the school." All of the dead were dual Israeli-French citizens, the Israeli Foreign Ministry said. By 8 p.m., as a dozen police blocked access to the school, cries again echoed from within as community members mourned over the victims' bodies before they were to be flown to Israel for burial. Authorities immediately increased security at schools and synagogues around the country. The attack revolted France, where school shootings are extremely rare, and drew strong condemnation from Israel and the United States. France has suffered bouts of criminal anti-Semitism over the years, often targeting synagogues or Jewish cemeteries. Monday's slayings were the deadliest to target a Jewish site since Palestinian militants shot and killed six people in the popular Jo Goldenberg deli in Paris' Marais district in 1982. Officials in France have been particularly sensitive toward the Jewish community because of the country's World War II past of abetting Nazi occupiers in deporting Jewish citizens. Sarkozy and his main challenger, Socialist Francois Hollande, rushed to pay their respects in Toulouse. In Paris, Notre Dame Cathedral hosted a special Mass to honor the dead. Schools across the country planned a minute of silence in commemoration on Tuesday. In France's increasingly tense and raucous race to the presidency, the subject of immigration — a buzzword that has often served as a cloak for racist sentiments — has taken a central role. Critics have accused Sarkozy of taking a hard-line tack on the issue to siphon off votes from the far right. His conservative government was on the defensive on Monday, emphasizing their response since the first shootings on March 11. Interior Minister Claude Gueant, a close Sarkozy ally, said some 200 investigators have been assigned to the cases, though there were "no clear leads" and it wasn't clear if the assailant was acting alone. Sarkozy said 14 riot police units had been assigned to "secure the region as long as this criminal" remains at large. The terror level was raised to scarlet — the highest level since the four-point system was created in 2003. In the wake of the shootings, the New York Police Department stepped up security at synagogues, and U.S. State Department spokeswoman Victoria Nuland condemned an "unprovoked and vicious act of violence" in France. Israeli Prime Minister Benjamin Netanyahu also condemned the attack. "It's too early to say what the precise background for this act of murder is, but I think that we can't rule out that there was a strong, murderous anti-Semitic motive here," Netanyahu said. A police official said the same .45-caliber handgun used in Monday's attack was used in the shootings four days earlier that killed two paratroopers and seriously injured a third in nearby Montauban, as well as an attack that killed a paratrooper eight days earlier in Toulouse. In Monday's attack, the killer also used a .35-caliber gun, firing at least 15 shots at the school, police officials said. "The shooter is someone used to holding weapons," said Nicolas Comte of the SGP FO police union. "He knows what he's doing, like an ex-military guy." Sarkozy said that Monday's shootings and the earlier paratrooper killings appeared to be motivated by racism. "Of course, by attacking children and a teacher who were Jewish, the anti-Semitic motivation appears obvious," Sarkozy said. "Regarding our soldiers, we can imagine that racism and murderous madness are in this case linked." France is home to Western Europe's largest Jewish community, estimated at about 500,000, as well as its largest Muslim population — about 5 million. Toulouse, a southwestern city north of the Pyrenees mountains, has about 10,000 to 15,000 Jews in its overall population of 440,000, said Jean-Paul Amoyelle, the president of the Ozar Hatorah school network in France. He said its Jewish community is well integrated into the city. After Monday's shooting, six bullet holes pierced the high, white aluminum fence next to the school's entrance, at the spot where the rabbi and his sons were killed. One officer held a distraught girl, her face in her hands. A boy in a yarmulke and his mother walked away from the site, their faces visibly pained. Corinne Tordjeman said she had just dropped off her 14-year-old son, Alexandre, when the gunman arrived. Her younger daughter was supposed to go to a birthday party this weekend with the girl who was killed. The killer "knew that killing Jewish children would make a lot of noise, but tomorrow it could be a Christian, a Muslim, or anyone else," she said. Baroukh said he had spoken to Sandler only moments before the attack. "I said "Bonjour" to him like normal," he said. "Then he went out into the school entrance. I heard the shots and I turned around and saw him on the ground ... I panicked and started running away." Elaine Ganley and Thomas Adamson and Sarah DiLorenzo in Paris and Amy Teibel in Jerusalem contributed to this report.